Mass. General’s Dr. Karen Winkfield says that to improve access to health care and clinical trials, the solution has to be sustainable. When Dr. Karen Winkfield leaves Massachusetts General Hospital to discuss health issues at Boston-area churches and clinics, she refers to her message as the “triple A:” awareness, advocacy, and ambassadorship. 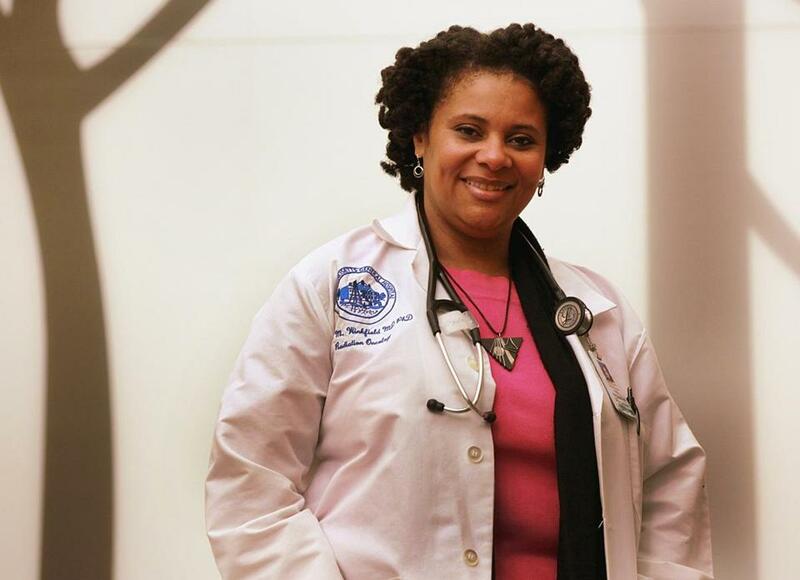 It’s a message that the 44-year-old radiation oncologist says she developed during her outreach work with racial and ethnic minorities, who report having more difficulty accessing health care than their white counterparts, according to a federal study. Winkfield said she wants to break down the barriers these communities face in accessing health care, including obstacles to enrolling in clinical trials. Winkfield, who grew up on Long Island, N.Y., says she first became interested in barriers to health care as a medical student at Duke University, where she volunteered at a health clinic in a public housing development in Durham, N.C.
Harvard Pilgrim diversifies its offerings to include Eastern treatments and transgender health services. Most of the patients were elderly and didn’t see a physician regularly, Winkfield says. Some, for example, knew they had diabetes, but didn’t correctly use meters for measuring their blood glucose levels, she recalls. Later, when Winkfield was doing her residency in radiation oncology in Boston, she says, she met an African-American woman in her 60s who had diabetes and hypertension. The woman had stopped taking her medications because they became unaffordable, and, as a result, developed an ulcer on her foot. “She wasn’t necessarily savvy enough to say, ‘Hey, I cannot afford these medications. Are there other options?’ ” Winkfield says. A national report released in May by the federal government’s Agency for Healthcare Research and Quality says 26 percent of Americans — especially racial and ethnic minorities and poor people — report having difficulty getting health care. When Winkfield came to Boston in 2006 to complete her medical training, she says, the Dana-Farber/Harvard Cancer Center approached her about participating in outreach events sponsored by faith-based organizations. She started out with talks about breast cancer and traveled to churches in Dorchester, Randolph, Cambridge, and Brockton. The Rev. Barbara Dulin of Greater Love Tabernacle Church in Dorchester says Winkfield has been instrumental in educating parishioners about breast cancer, which is more likely to kill black women than all other women, according to the Office on Women’s Health at the Department of Health and Human Services. Pastor Lawrence Ward of Abundant Life Church in Cambridge says Winkfield gave a talk at the congregation’s block party in 2012, and then counseled his family when his sister and sister-in-law were diagnosed with breast cancer. Winkfield has also appeared as a guest on Touch 106.1 FM, a popular unlicensed radio station that was shut down by federal agents in April. 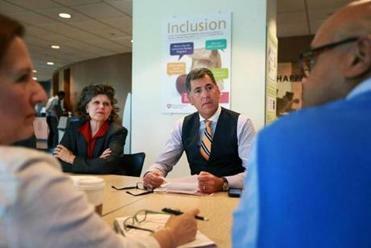 Five months ago, Winkfield was named to be one of the leaders of the Lazarex-MGH Cancer Care Equity Program, a three-year, $3 million effort aimed at increasing clinical trial enrollment in medically disadvantaged communities. Winkfield says she’s helping to enroll racial and ethnic minorities in an open clinical trial looking at two different types of radiation techniques to treat prostate cancer: photons and X-rays. She says that getting them to participate in the trial is important because black men have the highest rates of prostate cancer and get the disease earlier in life. Winkfield says about 10 percent of the people who have enrolled in the prostate cancer trial are minorities. Winkfield says there are multiple obstacles to enrolling black men in such a trial, including reluctance to participate, distrust of the medical establishment, and logistical obstacles such as transportation and finances. Winkfield says that to make headway, the solution has to be long lasting. .com. Follow her on Twitter @lauracrimaldi.